Tidying your garden has never been so easy - The Cobra BV26C Blower/Vac with 10:1 mulching is not only lightweight, but with its ergonomically positioned controls has improved support and balance. This lightweight but powerful 26cc Blower/Vac is ideal for medium to large areas. 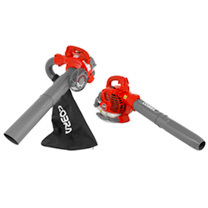 Handheld, but with the included shoulder strap to take the weight of the collection bag. 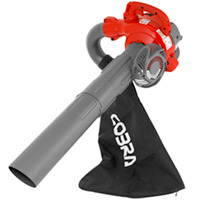 Cobra BV26C with Blow to Vac system - The lightweight Cobra BV26C petrol Blower/Vac has been designed to make clearing your garden a simple and effortless task. You can convert from collect to blow in an instant by simply changing the tubes. 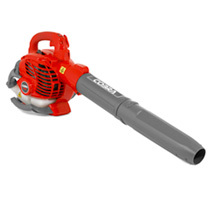 Making clearing your garden debris even easier.